Everything around me is screaming “50!” My parents celebrated their 50th wedding anniversary not long ago, I turned 50 this year (yes I just said that out loud), this year the Super bowl turned 50, and we just celebrated my husband’s 50th birthday as well! In the Jewish tradition I believe the 50th year is the Year of Jubilee; at least that is what I’ve been told and I like it — I’m going with that! This year we are also celebrating with the Stone Arch Players and yes, they are reaching that Jubilee year of 50! 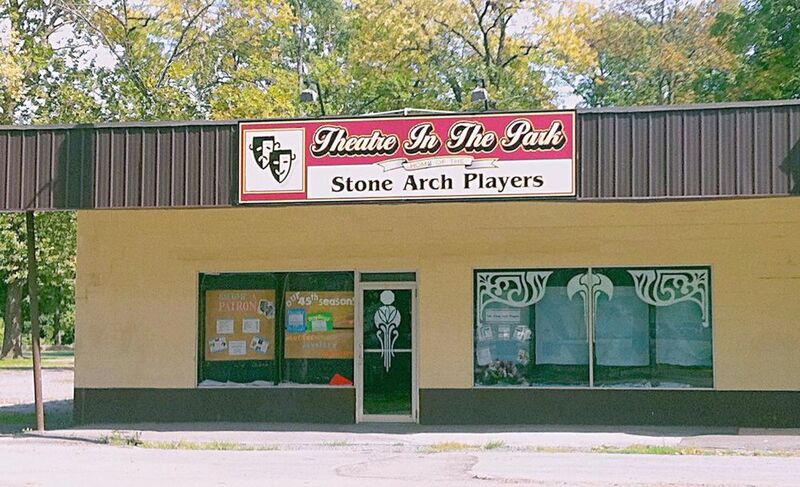 Recently I was able to sit down and chat with Thiry Olbrich about the Stone Arch Players. Thiry and her husband, Paul, are founding members of the group from 1967. They and their friends Kirby Bowen, Charlie Sims, Pat and Bob Robinson, Vicki and Dale Gates, and others saw the need for a place to experience the arts in the way of theater. After discussing the idea for many months they began by putting on workshops for the community. During these workshops they taught skills like reading scripts with expression and character, stage direction, and set construction. These groups were held at the YMCA, Kirby’s beauty salon, the Green Gables Restaurant, or wherever they could find a place. Thiry says it wasn't long until they had gathered around them a group of excited thespians and were ready to attempt their first play. The first production was “The Mouse that Roared” and it was large: whopping 40 person cast! But where would they rehearse? Rehearsals were held anywhere they could find a gracious host: sometimes the YMCA, or Miss Judy would allow them to use her studio, and sometimes Kirby opened up his beauty salon for rehearsal. Basically the community was behind them and was happy to work with them to accommodate their needs. The productions needed a stage, however, and again the community kindly offered, through school boards and principals, the use of the area high schools. Those were challenging days as the group could not get into a school building until mid-afternoon on a Friday for a show that would open that night. Sets were built off-location and many items were stored in a building called “Hoops School”, an old school house in which the owner kindly allowed the Stone Arch players to store their sets and other materials. Those seats were eventually reupholstered and were moved into our current location at the Theater in the Park in Kish Park. Those seats were recently replaced, and while it made the theater look amazing, (between you and me) I think the old ones were more comfortable. So here we are, ready to enter our Year of Jubilee. What will it bring? Will we still be here in fifty years? I hope so. This has been a place for people who have that bent to flourish and express themselves in ways that most everyday situations do not allow. Want to sing your answer to a question posed? If you are in a musical, sing your heart out! Want to do a real spit-take to surprising news? If you are performing in a farcical play, spit away! Always wanted to smoke a pipe, stoically looking like you have all the answers to life’s mysteries? If you are playing the greatest detective of all time Mr. Sherlock, or someone much like him, smoke away! Rehearsals are currently taking place at the theater for this season’s opener “The Mouse Trap” by Agatha Christie. It is the longest running play in history; it opened in the West End theater in London in 1953 and has run continuously since that time. I recently asked the current cast why they became involved in theater. Many people refer to this need to act as a bug, that the acting bug bit them as a child and they have loved the stage ever since. Many of our back stage crew are teenagers, so hearing their answers was very interesting to me: most said that they felt accepted here, that they felt safe, that it was great to be with other people and adults who “get them”. For me it is all those things along with the camaraderie that happens during a production, the ability to practice our craft with like-minded people, the chats with new friends in the dressing room, and the plain old fun that it brings to myself and to others who come to watch. Therein lies the real hero of our story: The community. Our community has given so much over the years, including businesses donating materials for us to use as theater décor, donating props, offering spaces to practice, and providing places to store our stuff. And most importantly, we recognize and thank those wonderful patrons and friends who continue to come year after year to see a show — a show that we hope makes them laugh, cry and sit on the edge of their seat in suspense! For show times and dates for our Jubilee year check out our current season, get ticket information and like us on Facebook.